Looking for things to do in Palm Cove and surrounds? This guide introduces 30 of our top things to see and do in the area, plus where to eat, stay & play. Northern Queensland is known as the place where the rainforest meets the reef. They aren’t just any rainforest and reef though, they’re the Great Barrier Reef and the Wet Tropics of Queensland. Both are UNESCO World Heritage listed for their unique natural beauty and biodiversity. We explored them in detail during our visit and will be sharing some of our top tips in the things to do section below. Whether it’s a romantic weekend away, a family holiday or a nature escape, this region is the perfect tropical destination in our view. Cairns airport is the gateway to the rainforests and reefs of Tropical North Queensland. Most visitors, both domestic and international, will arrive through this regional airport. We flew in from Brisbane with Jetstar Australia, a short 2 1/2 hour flight away and as it’s also their Australian hub for many of their international flights they are an affordable and easy way to access this idyllic tropical escape from many major cities in Australia. We partnered with Jetstar for this Tropical North Queensland adventure and flying up the east coast into Cairns it was like we were on a scenic flight over the Great Barrier Reef National Park. 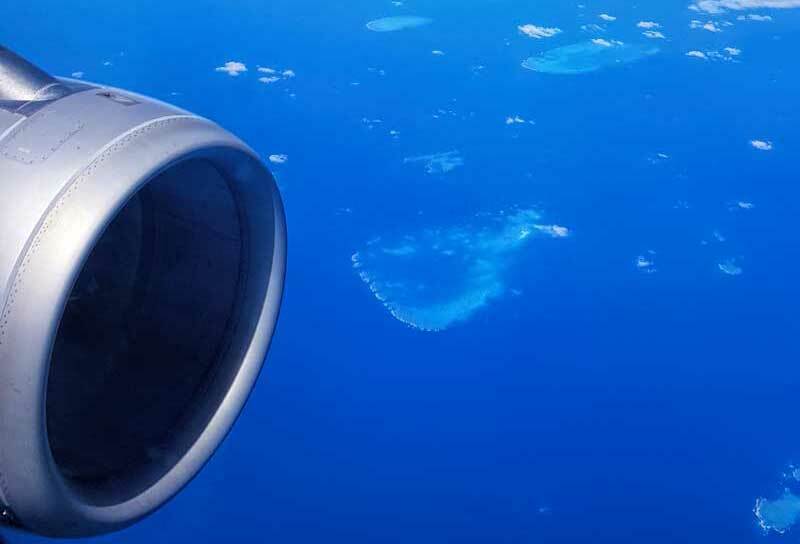 The flight path was just off-shore all the way up the east coast and this was our stunning view! I don’t know if this is the standard route but I’m making a note to always book a window seat in future! Once on the ground coach transfers are easily available to the major hotels in Cairns and further afield to the northern beaches and Port Douglas. On a previous stay in Port Douglas we’ve used this option and it’s very efficient, that coastal drive up the Captain Cook Highway would have to be one of the prettiest in the world. On this trip we decided we wanted to be able to explore on our own time frames so we rented a car from Avis at the Airport for the week. This got us to the beach with the minimum delay and allowed us the freedom to explore when and where we wanted to. As we’re largely independent travellers we prefer the flexibility it gives and it was a cost effective choice for our travel itinerary. 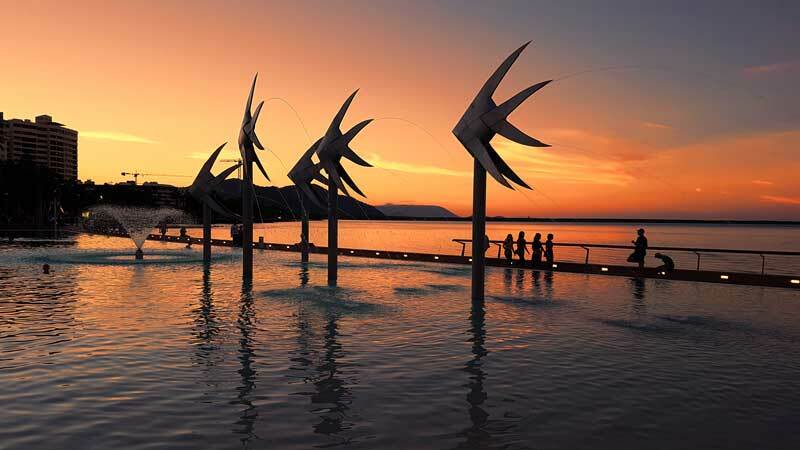 As Cairns is the gateway airport, many refer to the wider area of Tropical North Queensland as a holiday in Cairns but there are a variety of options on areas to stay depending on your timeframe, budget and preferences. The city of Cairns has a lovely foreshore area and plenty of attractions of its own however it’s not the picture postcard beach setting that most leisure travellers are after. It’s a port city that services reef and island day trips and transfers in addition to the major cruise liners. It’s also a very popular destination for MICE (meetings, incentives, conferences and events). Having attended an IT conference here in my corporate days I can attest to it being a great location for it, with well-appointed hotel facilities and plenty to occupy your downtime. 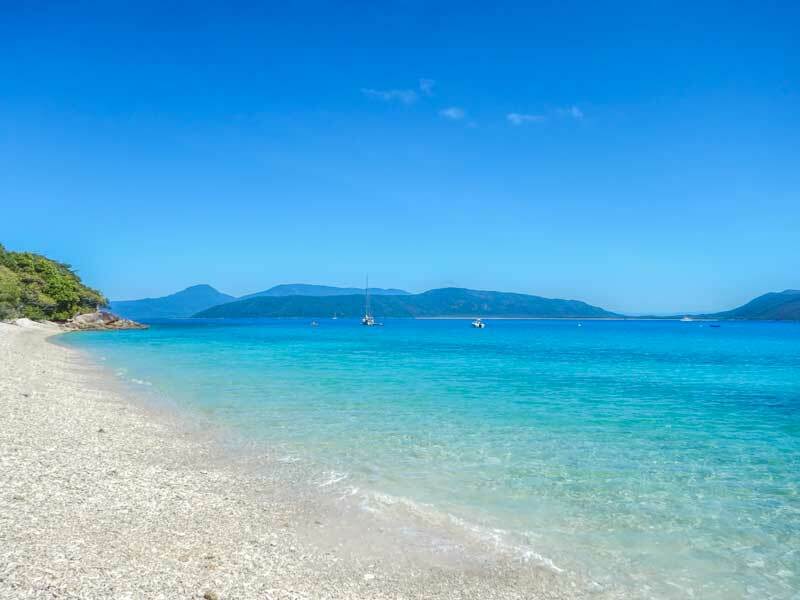 Only 15-30 minutes from the airport you’ll find the Cairns northern beaches, these are idyllic stretches of sand with all the convenience of a relatively easy distance to the airport, city, rainforest and reef. The most popular of these beaches and offering the greatest variety of resorts and restaurants is Palm Cove, our beach of choice for this trip. Trinity Beach and Yorkeys Knob equally offer some gorgeous coastline to the south and are slightly closer to the city. An hour north of Cairns is Port Douglas, still a very easy distance and extremely popular as a holiday resort. It’s larger and more spread out than the Northern Beaches but has it’s own port providing reef tour options. Many fabulous restaurants and places to stay are located along the coast and through to the centre of town, Macrossan Street. Almost all tours will have a Port Douglas pickup and in combination with its own gorgeous beaches we have found it to be a great place to stay on a previous visit without our own transport. Two hours south of Cairns is Mission Beach and this part of the Cassowary Coast is another popular and gorgeous destination. 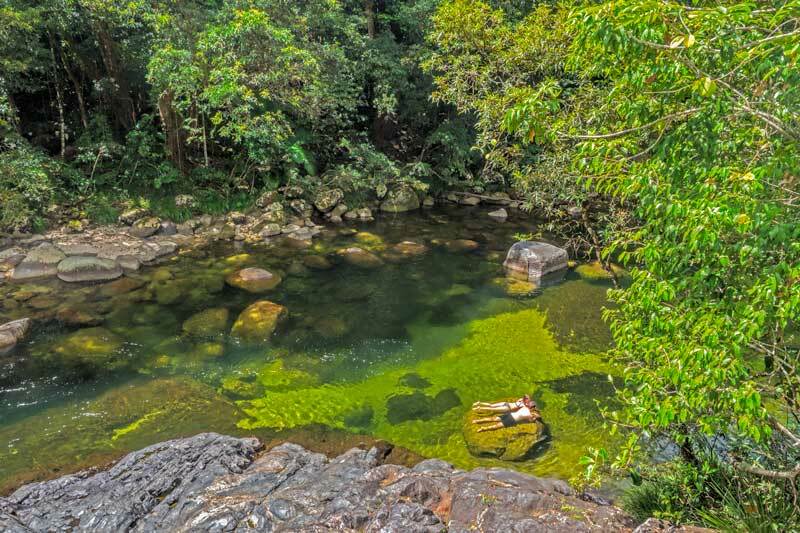 It’s a more convenient base if you plan to spend much time exploring the Atherton Tablelands and the popular swimming holes in this region. It should probably go without saying that the first thing you want to do on arrival is check out the nearest beach, this is after all what Tropical North Queensland is all about. There are so many gorgeous strips of sand and palm trees to choose from that it can be difficult deciding where to put down your towel but Palm Cove is a great place to start. Then you can work your way up and down the coast, the beaches are all stunning with their own highlights. There are two businesses offering kayak rental and guided trips out of Palm Cove. Double Island is the distinctive island nestled just off the coast of Palm Cove and surrounded by extensive fringing reefs. Kayak trips are possible for anyone of average fitness, and paddling experience isn’t necessary but I would suggest that you pick a day with calm seas, it will be a better trip out with an increased chance of seeing wildlife. Pacific Watersports and Palm Cove Watersports both offer a variety of daily kayak and snorkeling trips to Double Island. No guarantees of course but they say that around the island is a great spot for seeing turtles and other marine life. There’s something special about sitting on the beach and watching the sun come up over the water. 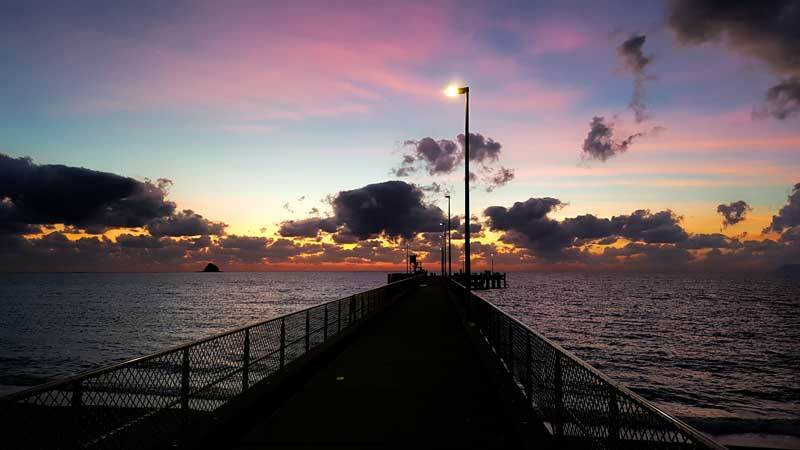 Yes, it does require a somewhat early start in Queensland, especially in summer without daylight savings but it’s well worth it especially if you only need to walk a few steps to enjoy it. At the northern end of Palm Cove is a wharf that’s popular with local fishermen. Drop a line in the water or walk out for a different perspective on the coast and chat to those fishing to find out whats catching at that time of year. No not Cairns beach, this is just north of Palm Cove on the Captain Cook Highway to Port Douglas. 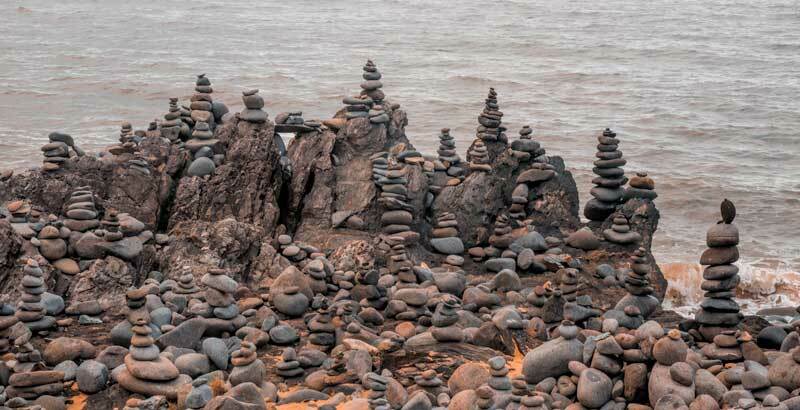 It’s near Ellis beach but I don’t think it has it’s own name, you’ll see a small pull off area to park at a beach of smooth rocks where many locals and tourists have added a cairn to the ever growing collection on the beach. A storm or extra high tide knocks them down on a regular basis and they quickly reappear. It’s an unusual sight and an experience to add your own creation. This really is a slice of paradise and after spending an incredible day out here we can’t wait to get back again and stay a night or two on the island. Nudey beach (no it’s not a nudist beach, not now anyway) is about a 15 minute walk from the wharf and is absolutely stunning. We found it so hard to drag ourselves away to catch the boat back to Cairns at the end of the day. There’s no surprise it was named in the top 10 beaches in Australia, I’m just surprised it’s not in the worlds top 10 but perhaps we should keep it quiet we don’t want it getting too popular. On the very slight chance you get bored with swimming, snorkelling, lying on the sand and staring at its beauty you can hire paddle boards, do a kayak trip, take a glass bottom boat tour or take one of the other walks around the island. Facilities on the island are limited. Near the wharf there’s a private resort that’s closed to day visitors, a beach hut to hire equipment and a bar and cafe. There are also public toilets and coin operated lockers if you want to secure some of your gear while out on the water or not carry it all with you. We were initially attracted to Fitzroy by the idea of sea kayaking around the island and fringing reef. 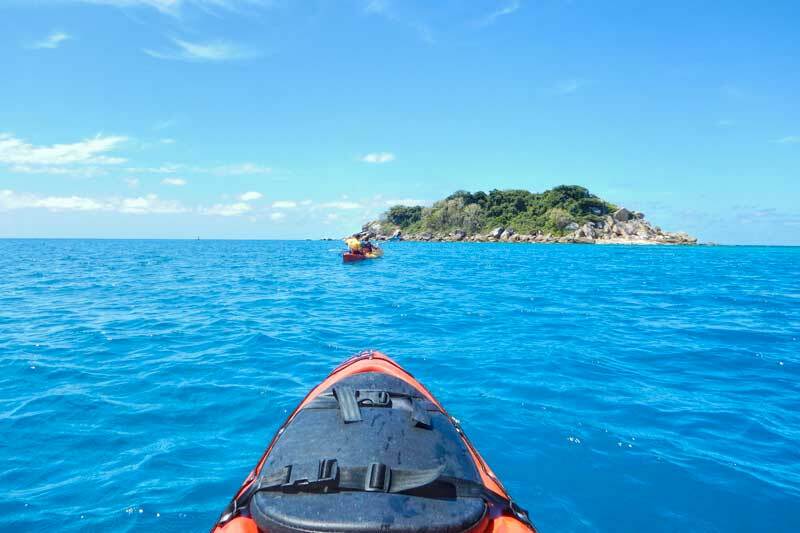 We booked onto a half day trip guided kayak with Raging Thunder that took us along the coast, past the turtle rehabilitation centre and across to Little Fitzroy Island. It was a fabulous day for it and an easy paddle, the broad double sit-on-top style kayaks ensured no one tipped over despite some inexperienced paddlers in the group but I felt it was largely a credit to our tour leader Brendan who kept a good eye on us all and worked within our abilities. You can read more about Fitzroy Island and our day over here in this article. The Great Barrier Reef is one of the big drawcards of Tropical North Queensland. It’s the worlds largest reef system made up of over 2,900 individual reefs including the fringing reefs around the inner islands. The closer you get to the outer edge of the reef the greater variety of sea life and coral you’ll be likely to see although snorkelling the fringing reefs offers some great viewing too and can be a good option for those newer to snorkelling or with less water confidence. Do you want to leave from Cairns or Port Douglas? This can depend on where you are staying and which reefs you want to visit. Do you want a pontoon or boat based dive platform? With children, reduced mobility or for less confident snorkellers the pontoon offers some advantages. If you prefer a boat based trip do you want it to include multiple reef sites? Some of the smaller boats offer up to 3 sites in a day. Size of the boat. This will impact how many people you are out there snorkelling with but also the facilities and potentially the time taken getting out there. 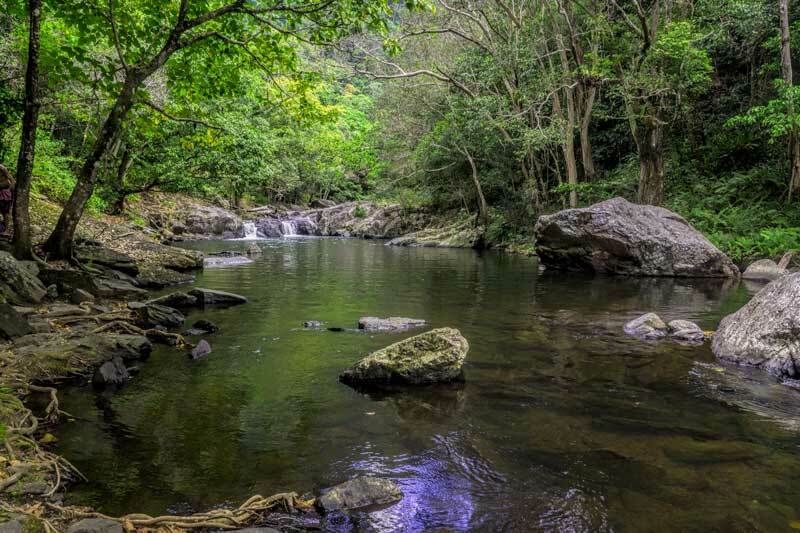 The Barron National Park is part of the UNESCO World Heritage Listed Wet Tropics rainforest. This is the forest you glide over and wander through on your Kuranda Skyrail experience. We’ve done this trip on both of our visits to the area, it’s so peaceful gliding over the forest and you get a completely different view of the landscape and the extent of the rainforest from up there. 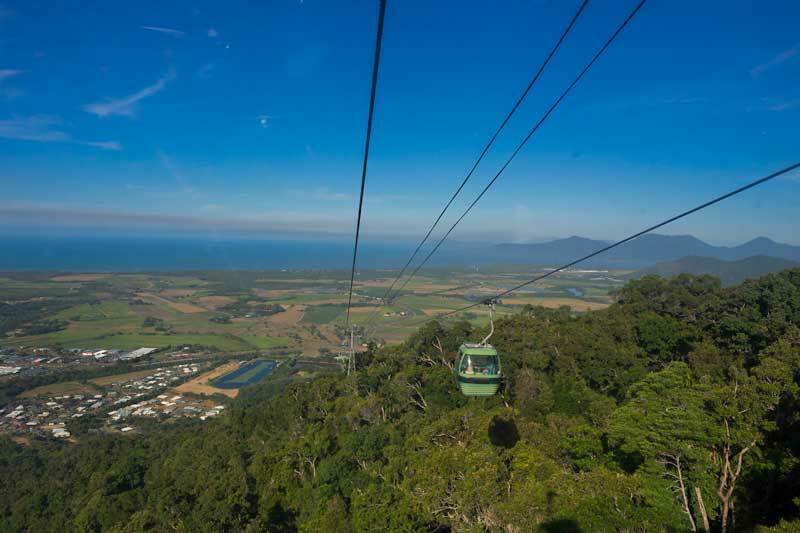 Read more about our Skyrail experience and things to do in Kuranda in this article. This stretch of rail was built over 120 years ago and Queensland Rail has offered transfers to Kuranda on it for over 35 years. The trip takes just under 2 hours to Kuranda including a stop at the Barron Falls lookout from the opposite side to the Skyrail. Remember to be at the platform early to get a window seat on the side with a view of the rainforest (right going up, left coming back). You’re allocated a carriage with your ticket but as it’s a heritage fit out the train has original styled padded bench seats facing each other so a specific seat isn’t able to be booked and some have a better view than others. 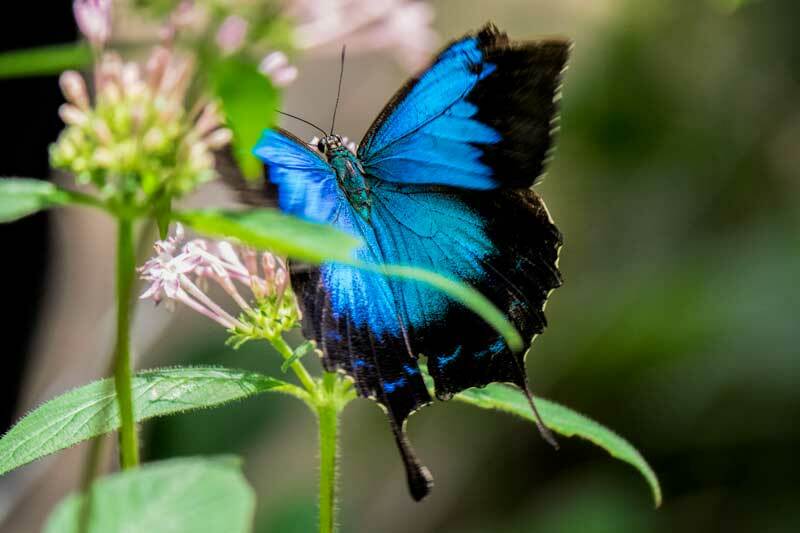 The Australian Butterfly Sanctuary in Kuranda is a top spot to visit while in the area, we’d not been to anything like this before and really enjoyed it. The butterflies are all bred in the facility which is privately owned and has been here in Kuranda for over 30 years. It’s the biggest free flight butterfly aviary and display in the southern hemisphere and the collection of tropical butterflies were so pretty. The area is landscaped with their favourite food plants, ponds and bridges to wander around and spot them. This one pictured above is the brilliant blue Ulysses that you see regularly in the rainforest areas around here. They move constantly and are so fast flitting around in the treetops . As soon as they settle they close their wings revealing a dull brown underside so it’s quite a mission to get a photo, I didn’t get a great one but I did much better here than outside. This landscaped walk through aviary at Kuranda Bird World includes a private collection of 60 rainforest bird species from Australia and around the world. With the exception of the endangered cassowary they are free to fly and wander around providing plenty of opportunities to observe them up close, you’ll likely even find the odd parrot takes a liking to your bag or shoulder and accompanies you around for a while. The little Geloccio stall is out the front of the Kuranda Heritage Markets, it’s not big and flashy but they have the best local gelato, ice cream and sorbet. These days of lactose-free I’m forever grateful to anyone that offers a good variety of freshly made sorbet but Drew assures me that you wouldn’t want to walk past the gelato either. Being in Queensland you really should try the rich and creamy mango which was delicious but I can’t stop raving about the lemon and basil sorbet. I know it sounds an odd combination but it’s so tangy and incredible that I know I’m going to be looking for it everywhere from now on although I don’t like my chances. The waterfront esplanade in Cairns was first surveyed in 1876. Over time it had turned from a sandy beach similar to those in Palm Cove and the other northern beaches to mangroves and mud with the dredging of the port channel. Today it’s been revitalised into an attractive and modern city park with a large lagoon pool, restaurants and cafes, play areas, picnic spaces and both a cruise ship and reef cruise port area. There’s a good size lagoon beach pool right on the esplanade surrounded by picnic and park areas. It’s a great facility for a quick dip to cool off and what a great spot to watch the sunset reflected in the eastern sky before heading along to dinner at one of the many water-front restaurants. We enjoyed a beautiful meal of local fish at the Boatshed overlooking Trinity Inlet one evening, both the red emperor with a bug crumb and the barra with a garlic and lemon sauce were excellent. A little further along Mondo on the Waterfront which is part of the Hilton is good for a casual meal or snack. We stopped here for lunch and a drink on our last day, they have a great position best enjoyed in the daytime and we found it very hard to tear ourselves away and head to the airport. You can hire bikes on the waterfront and are able to ride them on the footpaths and promenades in Queensland provided you give way to pedestrians. If you want to travel a greater distance or have limited time to get around it could be a great option. Cairns has an excellent botanical garden that’s very close to the city. It has the best collection of tropical plants in the country and is a real treasure trove to explore. You could spend ages seeing it all and while a lot is very structured I loved the natural state of this Pandanas swamp forest boardwalk. Other favourites to check out are the Gondwana heritage garden and the Zhanjiang Chinese Friendship gardens. Don’t make the mistake I did assuming these markets are open every day just because they have a dedicated site in the city. They’re open Friday and Saturday 5 am to 6 pm and Sunday until 3 pm. They’ve been going since 1975 and today are an icon known all across the country. Rustys has over 180 stalls many of which are fresh produce, home baked bread, seafood and other specialty products which are perfect if you’re wanting to put together some BBQs or picnics during your stay. Do make sure you allow some extra time for a coffee and to try some of the delicious treats on site too. The walkway through to the falls is an easy 1.2km walk on a wide paved path. Even though it’s paved you still need to keep your eyes open, we had a black snake cut across our path on the way up and a guy that went to pass us did a bit of a dance and a squeal when he saw what we’d stopped for, that was even more entertaining than the snake. To be fair though we do seem to be snake magnets, other friends who’ve lived in Australia all their life haven’t seen one in the wild. There are a number of sections along the path that have access down to fabulous swimming holes like this one. In the early spring the water coming down from the mountain is pretty chilly but Drew braved it for a very quick dip and it’s a beautiful place to stop for a while. There is a range of fun markets on in the area stocking a range of fresh produce, crafts and bric-a-brac that can be fun to attend as visitors to the area. If you’re heading up to Cape Tribulation you’ll have to take the car ferry across the Daintree River. On the south side of the river there are a number of companies that operate crocodile and wildlife spotting trips multiple times throughout the day. We went on the way back down from Cape Tribulation because that would give us the lowest tide and we just made it back across in time for the final 3.15pm trip of the day. We went with David at Solar Whisper as I’ve followed him on Instagram for years and liked the idea of the solar powered electric boat that is not only better for the environment but also really quiet making it easier to get close to the wildlife without disturbing it. This young crocodile is estimated to be around a year old. He’d got himself up on a lower branch of a huge old tree overhanging the river which is not where I was expecting to see him. 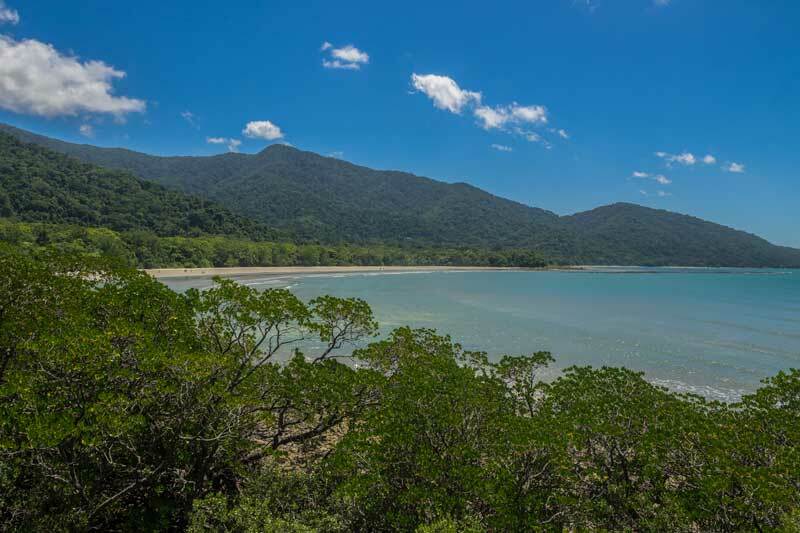 Cape Tribulation is the point where Captain James Cook ran the Endeavor aground on the Great Barrier Reef in 1770 creating the need to dump several cannons, ballast, and anchors in order to keep afloat long enough to limp into Cooktown for repairs, hence the name Cape Tribulation. We know it today as the point where the rainforest meets the reef and it’s a stunning beach. There’s a beach resort here with a restaurant for lunch and a public car park that leads along to the beach and a walkway up to a lookout over the bay. The beaches all along this section of coast are beautiful, we absolutely loved Thorton Beach although I recalled later it was the beach where a woman was taken by a salt water crocodile last year so not the place to swim perhaps but incredibly scenic. This is as far north as you can drive up the coast without a four wheel drive, to continue north in a standard vehicle you’ll need to backtrack to the Daintree River and head inland. 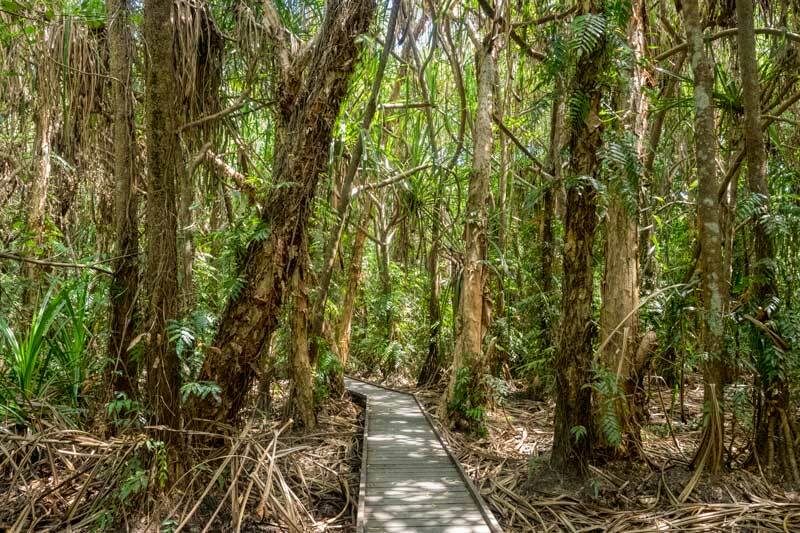 The rainforest in the Daintree is thought to be around 180 million years old and it’s ecosystem one of the most complex on the planet. There are plants still in this area that were here when dinosaurs roamed around. The Daintree Discovery Centre is made up of boardwalks, aerial walkways and a canopy tower that enables you to get in amongst all levels of the rainforest while providing detailed commentary through sign boards and the use of a personal audio guide to help understand the forest and its evolution. We really enjoyed the centre and spent a couple of hours here but wished we’d had more time available to continue exploring. Staff walk the trails during the day who are obviously passionate about the area and are happy to stop to point things to you and chat for as long as you want, it’s an educational resource but one that is really enjoyable for all ages. 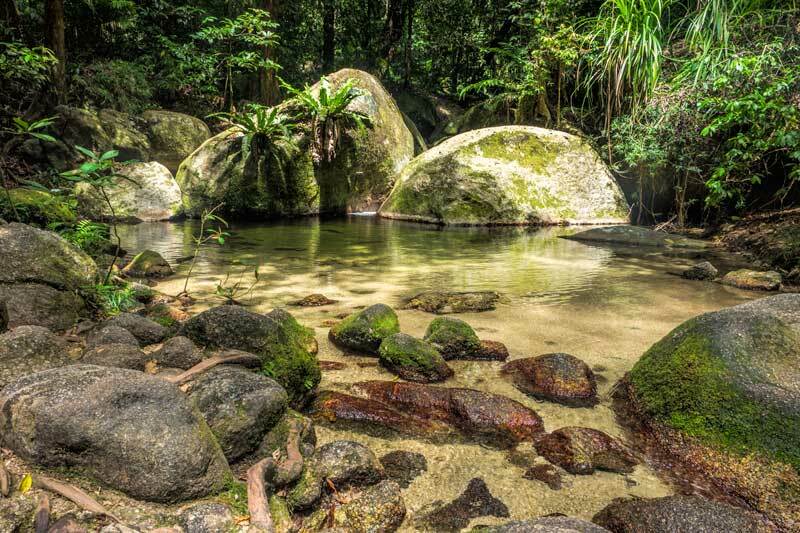 The Mossman Gorge is at the southern end of the Daintree Rainforest and you can easily spend a day here if you come prepared to swim or picnic by the swimming holes. You can’t drive in any further than the information centre so from there you can either walk along the road for 2 km to the start of the track of pay the $10 for the return shuttle bus. It’s well worth paying for the bus, the road is narrow, not very sheltered and dusty and you must stick to the road, the land either side is private. There walk is divided into 4 walking tracks but it’s basically the one circuit with detours out from it. All up it’s only 3.5 km and an easy to moderate walk on a clearly formed track without any significant obstacles. Some of the best parts are the detours off to the creek and swimming holes but the forest itself is beautiful with some interesting examples of strangler figs and granite rock overhangs. Along the Mossman Gorge walking tracks you can detour down to a couple of swimming holes in the creek that are really beautiful places to spend the day. At the information centre, we’d unfortunately decided to leave our swimmers and towels in the car based on the sign that didn’t recommend swimming due to fast flowing water. Talking to someone later apparently that sign stays that way all year so use your own judgement but with no real rain for months they were flat as mill ponds and we would have been very comfortable in them. On the way back we did take off our walking shoes and wade into the crystal clear water to cool our feet and sit on a few well-placed rocks in the pool. The main street of Port Douglas is Macrossan Street, this is where the majority of the shops, restaurants and some central accommodation is located. At one end you have the port where the reef cruise boats leave from and at the other end, you have the beach and look out. We’ve stayed at Martinique on Macrossan which is on the beach end of Macrossan on a previous visit and while not a large complex it offers great value and the position was extremely convenient especially if you don’t have your own transport. You can’t visit anywhere along this coast without taking a look at the beach and 4-mile beach in Port Douglas is no exception. It really is just miles and miles of gorgeous white sand and turquoise waters. While Port Douglas is the most touristed beach in the area when you have this much coastline it’s just never going to feel busy or crowded. Like all the beaches in this part of the country, you’ll pass many crocodile warning signs. Salt water crocodiles are extremely uncommon on the beaches so don’t go hoping to see one but there are confirmed sightings in the waters off the coast on a semi-regular basis. They come down from the rivers mostly during the breeding season when the bigger crocs in their area force them out of their patch of the river. 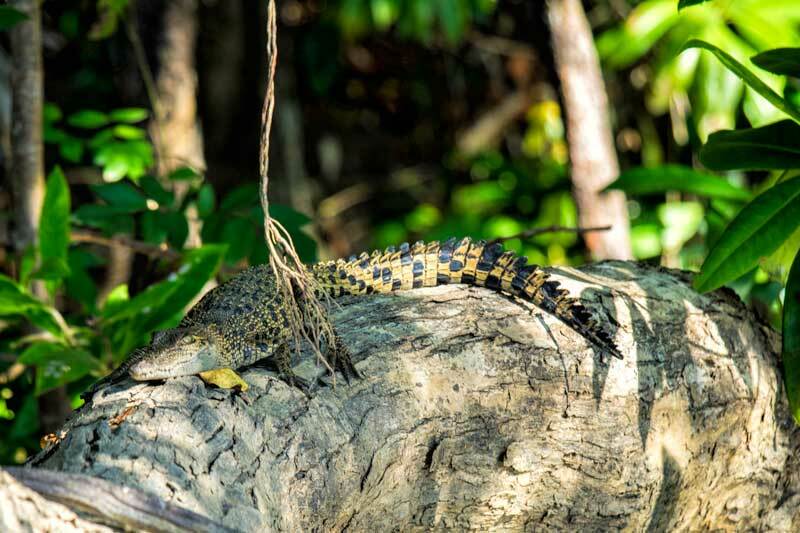 The crocodile population in Queensland is recovering which is a good thing environmentally but does mean that beach swimming up (and some rivers and creeks) here can have more risk than they did a decade ago. If you decide to venture into the sea stay in the patrolled areas and check with your hotel or the life guards on duty who will be able to give you better information on current risk levels. The views from up here down 4-mile beach are incredible. Drew took a run up here one morning and a flying leap on the way back down when a large eastern brown snake picked that moment to start crossing the path in front of him so that was his bit of wildlife spotting for the morning. That said you get snakes all across Australia, including city gardens and parks so don’t let it put you off getting out and exploring, just watch where you put your feet. This interesting park was built by Jose Paronella, a Spanish immigrant in the 1920’s. It was his home but from the start was intended as a public venue which opened in 1935. Jose built a castle, grand staircase, a refreshment room, projection room and a museum. The grounds were also planted with impressive gardens and avenues of stately trees. The location, however, wasn’t treated well by nature and in addition to many significant floods, it was hit by a cyclone and a fire in the castle. The current owners purchased it in 1993 believing again in what it could be and achieved National Trust listing for the property in 1997. There are many garden paths, a bamboo glade, swimming hole, picnic areas, a museum and the remnants of the original venue. If you go it’s worth doing the guided tour that’s included in the admission prices and don’t miss the tunnel with the microbats. You can also take part in a after dark tour if you’re staying nearby or using the campground for the night. The entry fee is a little on the high side at $45 per person but maintaining the property would equally be costly. Paronella Park is located at 1671 Japoonvale Rd (the Old Bruce Highway). You can also explore this area on an organised tour. We’ve previously done one run by Northern Experience Eco Tours which was a well-organised one day highlights tour. We’ve created a map to help you orientate yourself and group activities and attractions you might want to explore. This map has been created as a public map in Google maps so feel free to download or bookmark it here. As mentioned we stayed in Palm Cove on our most recent visit and have stayed in both Cairns and Port Douglas previously. Our choice in 2017 was Peppers Palm Cove. It’s a hotel and resort chain we’ve used frequently around Australia as we’ve found they’re invariably a good quality property ensuring a relaxing, stress-free stay. The location in Palm Cove was really convenient for the many places we wanted to visit this time and it’s a slower pace and less crowded than Port Douglas or Cairns. We loved the choice of 3 resort pools including an adults pool which was beautiful but a little on the cool side for our early spring visit. I’m sure that shade will be very welcome in a few weeks times though. The self-catered apartments and extensive swimming options made this a favourite for families and couples. I’ll include a link to a full review with photos here soon. A more affordable option while remaining beachfront and also a brand we’ve used regularly is the Mantra Amphora. This has a great position opposite the beach and in the midst of many fabulous restaurants and it also has a gorgeous pool area which many of the rooms overlook. A slightly more luxe option that I only discovered this trip but I would look up in future is the Alamanda Palm Cove. It’s home to Nu Nu’s which is now one of our favourite restaurants in Palm Cove. It’s the only hotel along here that’s right on the beach as opposed to across the road and it’s set apart at the southern end of the beach creating a feeling of seclusion and luxury, especially if your soaking in the adults only pool overlooking the beach and palm trees. It does offer something a little different. Palm Cove is a great choice if you plan to eat out most days as there’s such a great selection to choose from right along the waterfront. If we had to pick two standouts from our most recent stay, one would be Vivo mid-way down Williams Esplanade and the other Nu Nu’s part of the Almanda Resort at the southern end. Within an hour of arriving in Palm Cove we were sitting out on the deck at Vivo overlooking the palm trees and Palm Cove beach. It’s a stunning spot matched by the impeccable modern flavour combinations put together by their chef. Their current lunch menu really spoke to me with the Asian fusion dishes on offer. My eyes immediately went to the pork belly crepe, a coriander infused crepe loaded with Byron Bay pork packed with flavour from the hoisin, spring onion, coconut, sesame and crunchy shallots served along side an Asian herb salad dressed in a Thai style dressing with chilli palm caramel. It tasted even better than it sounded although I do have to say I still gave long lingering glances to Drews tempura soft shell crab in a kombu master stock which I did taste and had wonderful depth. We loved Vivo so much that we returned for an equally fabulous dinner later in the week breaking my own rule of trying somewhere new each day. Our other standout was Nu Nu‘s which had been recommended to us a couple of times during our stay. Realising it was our final breakfast and we still hadn’t been, we headed down. I have to admit that breakfast is my favourite meal of the day but this breakfast menu really is AMAZING. My cassava hash brown with avocado, feta, heirloom beets and poached eggs was delicious and Drews Queensland mud crab omelette in a ginger caramel broth was also a winner. If we hadn’t been hours off heading to the airport we would have come back for dinner and I seriously wished we’d tried it earlier in the week. We got a table right on the edge of the deck with an uninterrupted view through the palm trees to the beach, the service was impeccable and there was nothing on the menu I didn’t want to try. I’m not a follower of celebrity chefs but Nick Halloway’s Nu Nu’s is highly recommended. Lime and Pepper, an open air restaurant that’s part of the Peppers Resort has huge old paperbark trees growing up through and we enjoyed perfectly cooked lamb and steak meals here. For a casual lunch or dinner Flip’t is the place to stop for a burger, the Naughty Piggy crammed full of pulled pork was excellent but the standout would have to be the Magic Mushroom, you don’t need to be vegetarian to appreciate this creation! In Palm Cove and across Tropical North Queensland there are two seasons, the wet and the dry season. During wet season temperatures will be hot, the humidity high and this is also cyclone season. On the plus side the waterfalls are flowing beautifully the rivers are full and the rainforest is bursting with song and activity. The dry season is cooler with low humidity but for most visitors, it’s not cold and it’s a great climate to be active or relax in the pool. For us September has been the sweet spot, warm enough to swim, snorkel and kayak but cool enough to take long walks without melting. Temperatures are around 28 celsius, very little rain if any, and low humidity. At this time the humpback whales are visiting the reef but it’s not yet stinger season, a great time in our experience. You can check monthly average temperatures and weather conditions here on the government weather site. If you are comfortable driving then renting a car will give you the flexibility to include as much or as little as you want in your day, take detours and stop to see the little things (that are often the great things) along the way. We discovered many incredible beaches this way that no-one had told us about, some they haven’t even officially named yet. It’s a bit more remote up here so be prepared to drive a bit further than you might usually on holiday to discover it all. Choosing an apartment or other self-contained accommodation will allow you the option of preparing some of your meals. While you’ll no doubt want to try many of the fabulous restaurants, eating out 3 times a day can take the shine off it and really destroy your travel budget. There are plenty of fresh food markets, side of the road stalls and supermarkets to provide fresh local ingredients for breakfast, a picnic on the beach or the great Aussie BBQ to switch things up a bit. There are many unique experiences you’ll want to enjoy in Tropical North Queensland and it can get a bit costly to do them all so we help out the budget where we can by looking for great deals on our airfares and accommodation. We’ve been signed up for Jetstar Australia emails for the past few years meaning we are among the first to see the latest deals and we can book online when we see a good price come through. For accommodation we use Hotels Combined, they aggregate all our favourite hotel booking sites to find the best offer for the destination or property, you can then click through and book direct with those brands you already know and trust without individually searching every site. Take your most comfortable walking shoes with you. You don’t need to hike great distances but to see the region you are going to need to walk quite a bit and while the thong is the official shoe of the tropics (you can even pick up a pair from a vending machine at the airport if you want) you’re not going to like them so much after a couple of kilometres on a rainforest track. Contrary to what you might have heard not everything in Australia is going to bite, sting or eat you. Our wildlife and nature is amazing and shouldn’t stop you getting out and enjoying it fully. That said, exercise common sense, stay alert to what’s around you and take notice of the signage or locals knowledge. Also, remember to pack a good strength insect repellant – the mosquitos will bite you especially in the late afternoon if you don’t. Combining a visit to Tropical North Queensland with Uluru in the Red Centre and Sydney, our largest city, is known as Australia’s Golden Triangle. Don’t miss our guide to planning a short stay in Uluru or all the best things to see and do in Sydney. If you found this post helpful please save this image to Pinterest or share it on your social media accounts using the buttons below. We would like to thank our Airline Partner, Jetstar Australia and both Skyrail Cairns and Raging Thunder for their hospitality on our 2017 visit.